Indoor Walls - a quick summary checklist: a 'damp meter' and surface thermometer (see www.dampness-info.co.uk/meters.htm) are useful tools for this diagnosis - if not available use the back of your hand to assess the relative dampness of one affected area to another unaffected area. 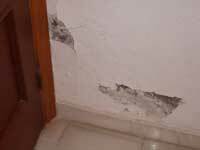 Symptom - white, fluffy salts, plaster possibly 'blowing' off the wall - 'efflorescence' - you have a water source which needs to be found and eliminated. Use our Water Leak Checklist (click here). Answer - Salt Neutraliser might work if you can find and stop the leak, or the plaster may be too damaged and need replacement to our Specification. Either replaster to our Renderproof Specification or line the walls with our Mesh Membrane - both act as barriers to the passage of damp and salts, but the Mesh Membrane also provides insulation and is foolproof. For help with 'salts' and how to eliminate them call our experts on 01626 336180 . Close up of fluffy white salts on a chimney breast. Symptom - damp patches on the ground floor - at low level, right down to the skirting board - that come and go - you have 'hygroscopic' salts that are attracting moisture from the air. Answer - you may have Rising Dampness, or your damp proof course may be 'bridged' by high outside ground, plaster on the inside or debris in the cavity (cavity walls only). Rectify any defects and if necessary inject Quick Cream at the correct level to form a new Damp Proof Course. 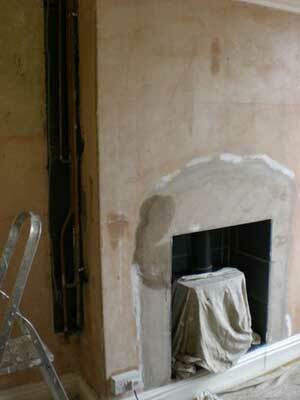 The plaster will need replacement to our Specification. 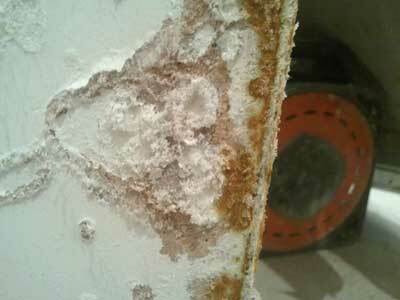 For help with 'hygroscopic salts' and how to eliminate them call our experts on 01626 336180 . Symptom - damp patches on or around chimney breasts - sometimes showing yellow or brown stains in wallpaper or paint - you have 'hygroscopic' chimney salts that are attracting moisture from the air, which may include tars and other chemicals from burning wood or coal. Answer - these 'salts' are very difficult to hold back in the wall, even with the replastering to our Specification carried out to perfection. We recommend using Mesh Membrane - a type of dry lining - to allow you to replaster using normal, lightweight plaster, with no risk of further 'salting'. For help with 'hygroscopic salts' and staining and how to eliminate them call our experts on 01626 336180 . Salt Neutraliser - a clear liquid used to neutralise 'salts' in render, plaster or masonry, either to attempt to save otherwise sound plaster or as a preparation prior to re-plastering to our Specification. Apply two coats, wetting in between with fresh water. 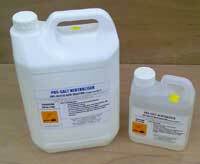 Renderproof - a blue concentrated additive for sand and cement, designed to be dissolved in water. It waterproofs the render mix and acts as a plasticiser and salt inhibitor. Mesh Membrane - easy to install dimpled plastic 'air gap' dry lining membrane, supplied in rolls like wallpaper. Designed to cover damp or salty walls and provide a fresh surface for replastering with a modern lightweight plaster (usually 'bonding'). www.drywallandfloor.co.uk - how to fit plastic dimpled sheets to damp walls to provide a new, dry decorative surface.